Open plan living with a boutique hotel vibe. 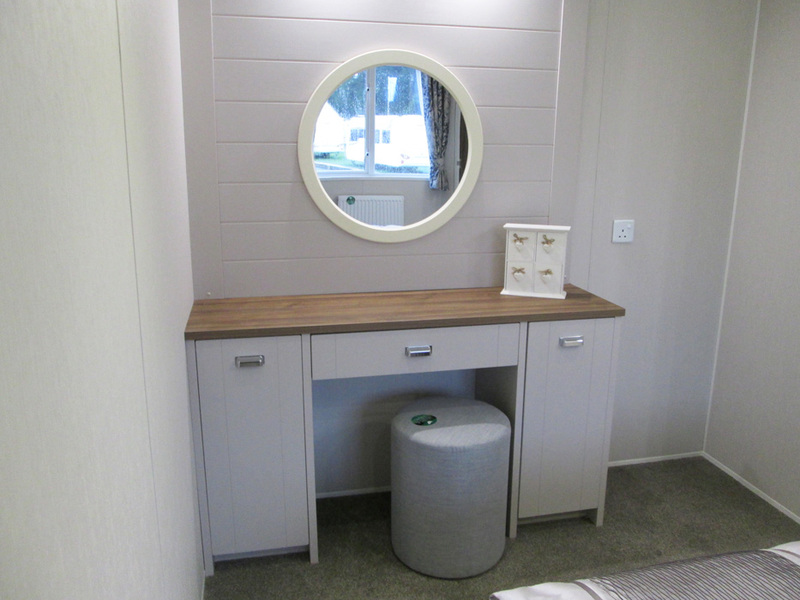 Willerby’s Sheraton static caravan is available in two models a 40ft x 13ft 2-bedroom and 40ft x 14ft 2-bedroom called the Sheraton ‘Plus’ (our review model) which offers a useful extra foot of internal width. The only real difference between the basic specification is that a bath is supplied as standard on the Plus. Thirdly, there’s a Sheraton ‘lodge’ specification which includes Canexcel cladding, outlook French doors and full residential Specification to BS 3632 (2015). 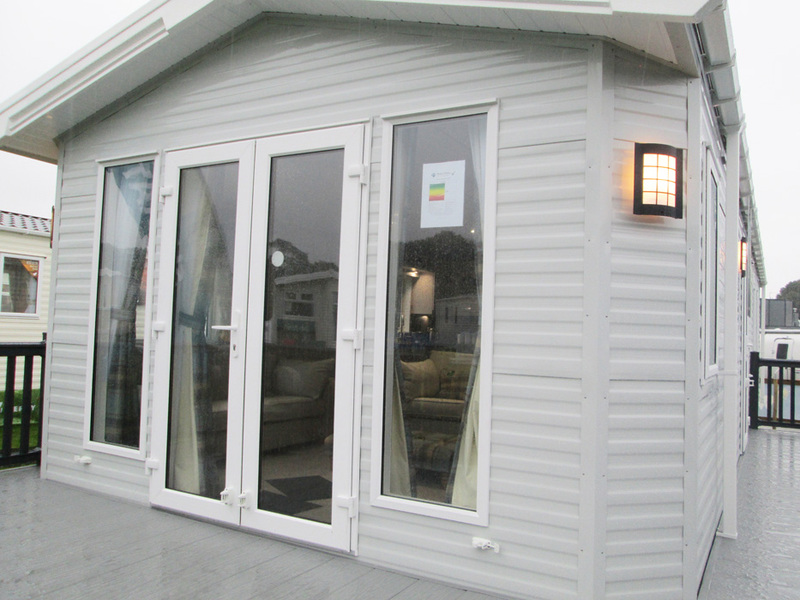 From the outside, the static caravan is clad in aluminium as standard, in a colour that Willerby call light grey. There are various other cladding options available, including Canexel in various shades, vinyl, real timber and you can also specify environmental ‘green’ exterior and window frames. Our review model was fitted with outlook patio doors at the front end, set between two tall, thin widows (these are optional as the basic spec has four tall windows). The two front corners have a chamfer which stops the caravan looking too blocky. The half-glazed access door is to the right. 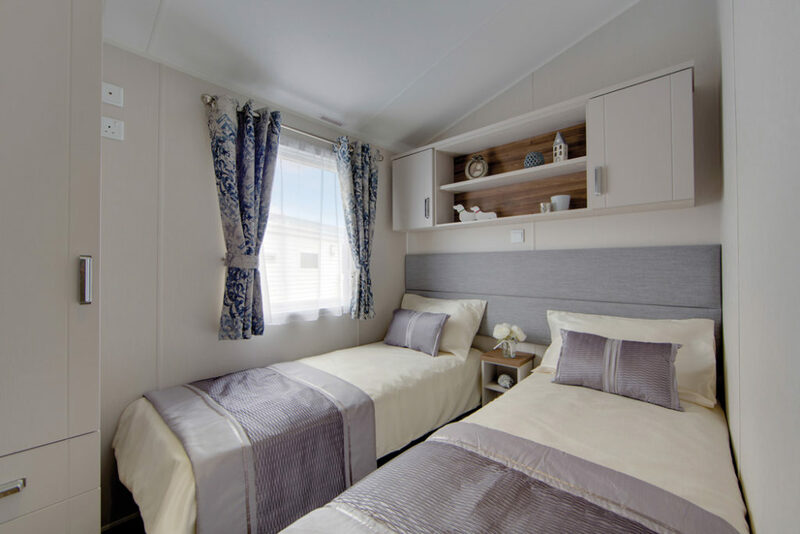 The caravan has a low-pitched black pantile clad roof and all the usual downspouts, guttering and bargeboards – again in uPVC for low maintenance and a longer life. There’s an external light fitted on the front right hand corner chamfer as well as one near the door on the side. The Sheraton is mounted on a fully galvanised chassis which is great to see as it will be far more effective in protecting the unit from the extremes of weather experienced more and more in the UK over recent years. 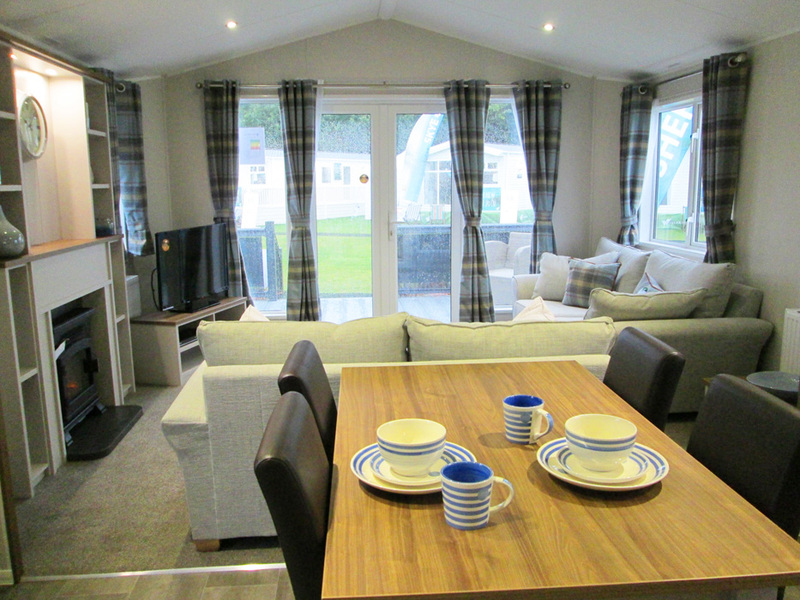 Entering the caravan, via the side access door you step into the open plan kitchen and lounge. The ratio between the kitchen/lounge and bedrooms/bathrooms across the 40ft x 14ft footprint is about 50:50. The open-plan nature of the lounge gives it a great feeling of space and comfort. Masses of natural light floods in through the triple aspect windows that also make the very best of the available views. The décor is subtle and stylish with cosy tartan fabrics to curtains, scatter cushions and ottoman – which contrast well with the light brown carpet and silvery walls and ceiling. Lighting is by discreet inset LED downlights and the absence of pendant fittings gives the space a clean, uncluttered look. The main focal point is a stunning feature fireplace in a light timber colour which Willerby calls Cashmere. It matches the walls, but with a strip of walnut accent colour across the top and mantle. A stylish electric flame effect fire is mounted below and there are plenty of open shelves for nick knacks on either side. Key lights are also fitted to the top rail which would illuminate perhaps a nice painting or piece of wall art hung below. As can be seen in the picture, in our review model this was a clock. Furniture supplied as standard with the Sheraton includes twin free-standing sofas (one of which contains a pull-out bed), a free-standing coffee table and corner unit with shelving for the TV. You also get various power sockets and a TV aerial point in the corner. The kitchen is very well equipped with an array of cabinets which are mostly arranged down one side. There are wall-mounted cabinets, too, one of which contains a microwave oven, as well as a set of open shelves above the sink and window. Cabinets are top quality units and all have soft close mechanisms and neat, sleek metal handles. 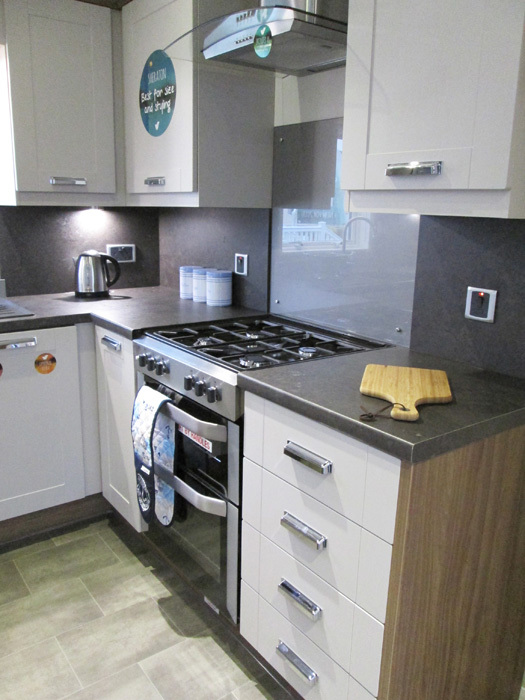 Doors are once again in a cashmere colour with contrasting splash backs and work surfaces in slate grey. At the far end, the cabinets make a 90 degree turn to the right and are split by the free-standing stainless steel gas cooker with four burner hob and grill above which is an externally vented hood and extractor. To the right of the door to the bedrooms are two tall cupboards, one containing the 70/30 fridge/freezer, the other for brooms, cleaning materials etc. To the left of the outside door is a stylish mini Welsh dresser with open shelving and drawers. 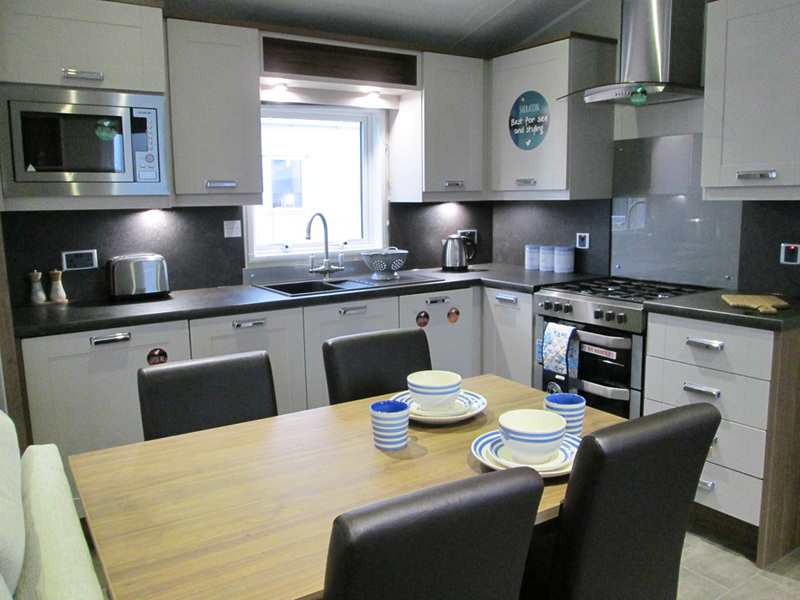 Willerby really have made the best use of space in this kitchen without overcrowding the space. Central to the kitchen is the free-standing dining table with walnut effect top and four black upholstered chairs. It’s good to be able to move the dining table around a bit depending on how many people are eating or using the kitchen at any one time. An access corridor leads you into the bathroom and bedrooms. It’s well-lit and contains a radiator. The twin bedroom comes first on your left. The two beds have space to walk between, have a central table with shelf and a padded headboard that runs across the wall above both beds. There’s a nice storage unit on the wall above the beds with open shelves and two cabinets and, at the foot of one bed, a single wardrobe with hanging space. The bedroom is decorated in light shades with luxurious bedding in a lilac which matches the curtains. There’s a socket and TV point on the bed side of the wardrobe where a small TV could be mounted on a bracket. Then there is the bathroom which uniquely to the Sheraton Plus has a bath tub, with glass shower screen and thermostatically controlled shower and a feature mosaic tiled wall panel, a semi-circular hand basin mounted on a vanity unit and the usual low profile, button flush toilet. 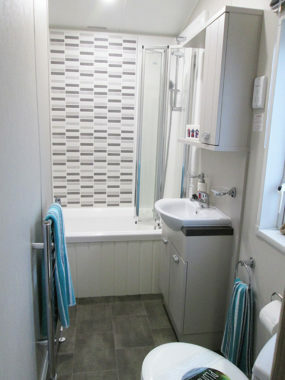 You also get a heated chrome towel rail and a shaver socket. 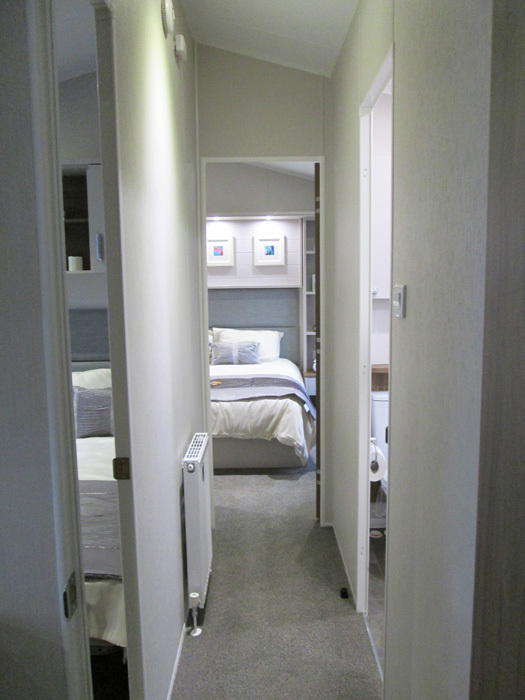 The main double bedroom is very luxurious with plenty of space. The king-sized bed (with lift-up storage) is centrally positioned and surrounded at its head with shelving, bedside tables with sockets for reading lights and a feature panel with three pieces of artwork with an inset LED light above each one. To one side is a large vanity unit with cabinets, drawers, a wide shelf, a tuck away stool and a centrally mounted circular mirror that’s lit from above. Opposite is a tallboy unit with plenty of drawers. To the right of the bed a discreet door leads into an almost secret walk-in wardrobe! Here there’s plenty of hanging space and storage for clothing. 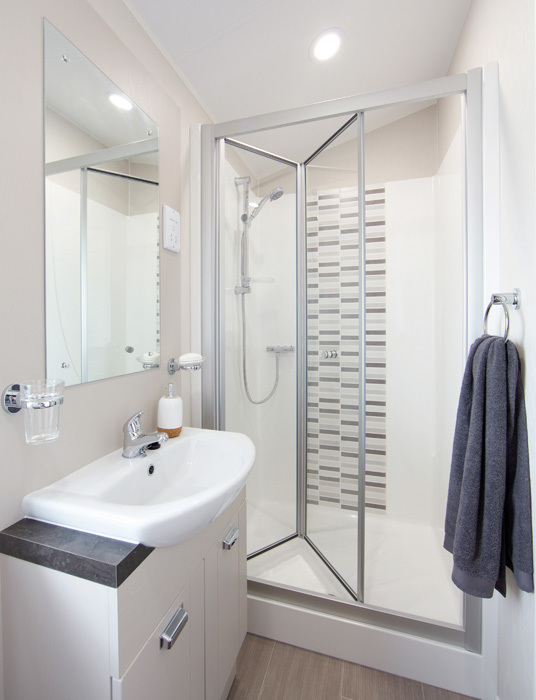 Move forward and you are into the en-suite bathroom featuring a one-piece fibre glass shower enclosure with thermostatically controlled shower, a semi-circular hand basin mounted on a vanity unit and low profile, button flush toilet. These are all very similar to those in the family bathroom. 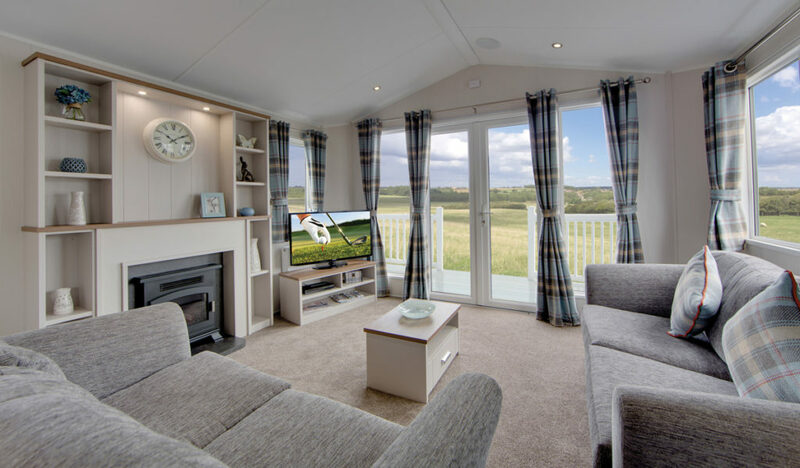 The Sheraton is a fabulous static caravan, which should appeal to lovers of boutique hotels. The décor and colour scheme used is subtle but contemporary, with clean lines to a well-appointed kitchen and even more luxury in the bedrooms. 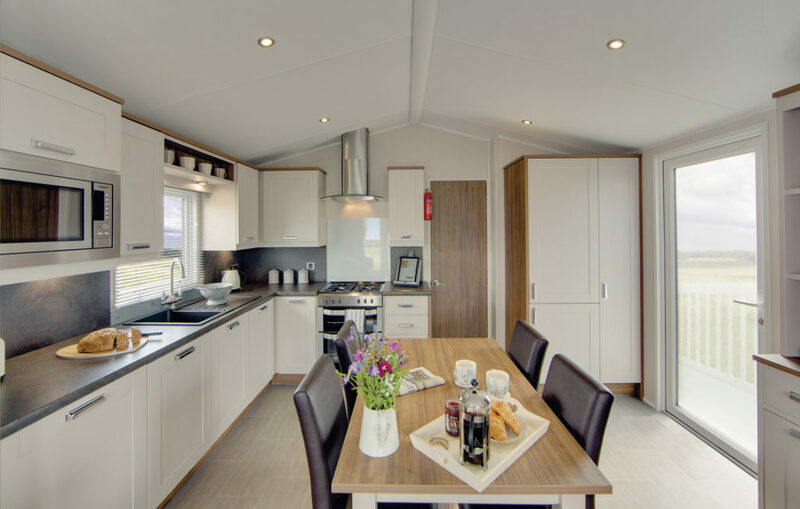 High quality fixtures and fittings plus a good selection of optional extras should make the Sheraton a winner for Willerby. Spacious, comfortable lounge with lots of light. Excellent kitchen with everything to hand. 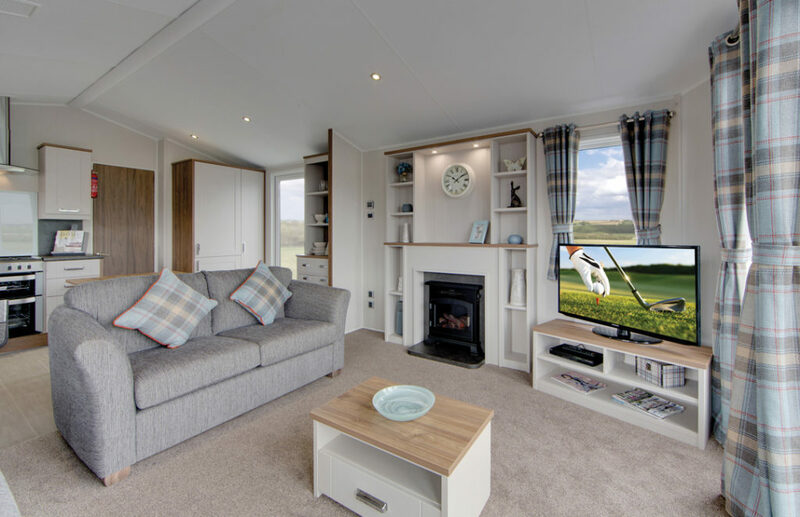 A contemporary, luxury holiday caravan with practicality and style that offers a little bit more. 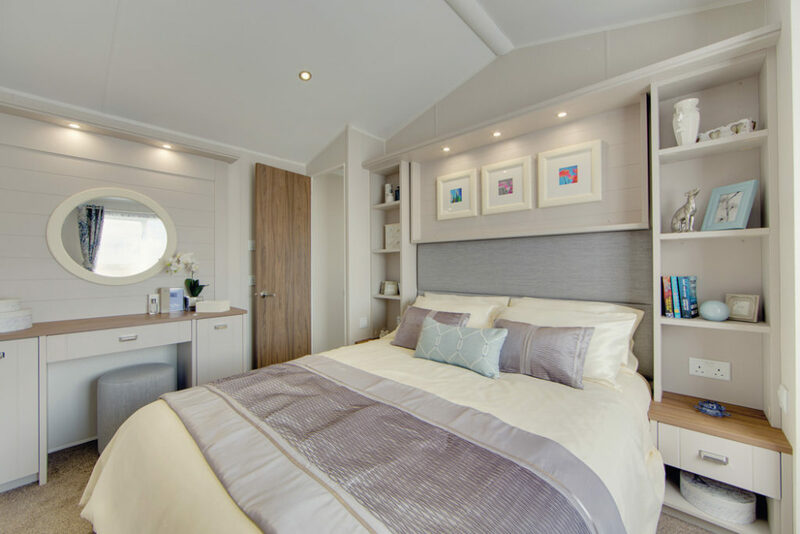 Berths: Six, in two bedrooms (one double and one twin) with two on an occasional fold down bed formed from one of the two seater sofas in the lounge. 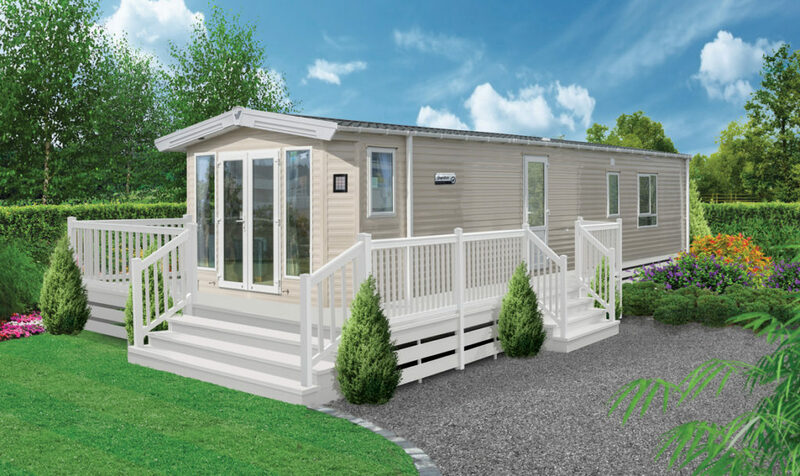 Key optional extras: Outlook French doors; exterior cladding – genuine timber, Canexcel and vinyl options; environmental ‘green’ exterior with green window frames; integrated MP3 sound system; integrated washer/dryer or dishwasher; integrated slimline dishwasher; Comfort Plus mattresses; bedding pack – suggested colour silver; Residential Specification BS3632 (2015); European specification; Sheraton lodge specification which includes Canexcel cladding or genuine timber cladding, outlook French doors and ‘Sheraton Lodge’ name badge. Do you use outdoor heating at your static caravan or lodge? I bought the 2017 model of the Sheraton. It is identical to the one featured here except no bathtub. I paid 49,500 which included wrap around decking and site fees for the year. I do think your being robbed! on our site at Thorpe St Peter just outside Skegness. they have a Brand new 2018 Sheraton Lodge for sale at less than 45000 that is on a lakeside plot with lovely views. the site is very quiet & peaceful. you really do need to shop around for holiday home purchase as prices vary massively..
P.S. The site is called, Rod & Line Country Park. Hi I just want you know that the new one is only a little different to mind. I would have had a bath if they were available when I bought mind. I had mine 1 1/2 yrs ago. I love every second I’m in the Caravan. Had a couple of problems since buying mine mainly to do with the plumbing. Also a minor problem with the washing machine which was down to being installed badly. The good news is that it’s very economic to run. It’s comfortably and easy to keep clean with lots of storage. Thanks for sharing your feedback Ann. Thanks. Looks great. Where can I see this in situ? Hi Sue, not sure which parks have these on site. 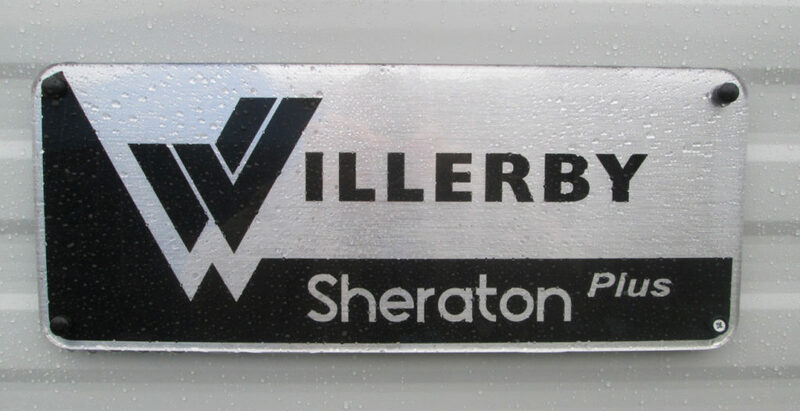 You might have to contact Willerby for that information. Looks like a gorgeous interior. Is it as high quality as it seems?